A young engineer with good design experiences from design had an idea. He visited the boss of Honda and introduced his vision. It was the year 1989 and engineer's name was Tadao Baba. His idea was to produce motorcycle with power of 1000cc engine but with controllability of 750cc. 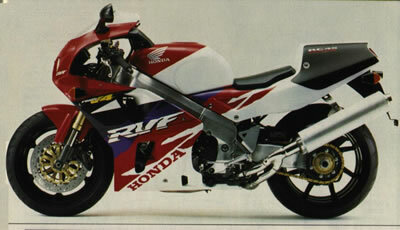 The FireBlade was born. In 1984 Kawasaki introduced the GPZ900 which reached 250 km/h and at same time was controllable. A year later Suzuki introduced famous GSX-R 750G. The origin of GSX-R was in factory model for endurance races and it was true racer. In 1986 Suzuki offered an even bigger and more powerful bike the GSX-R1100. This gave basics to the new modern sport bikes. But Suzuki made two blunders. The first was in 1988 when they introduced the GSX-R1100J whose weight was 24 kg more than than original model G. The next year Suzuki model GSX-R1100K lost 11 kg but had poor suspension . In the same year (1989) entered Yamaha the fight for the supersport throne with great FZR1000 EXUP but this was the best 1000cc bike at that time but its dry weight was 209 kg. And so we can start the beginning of the era of the FireBlade.